Burnet Institute is stepping up its commitment to gender equity in science through a range of initiatives. Burnet Institute is committed to gender equity in science. Our Burnet 2017-2020 Strategy Plan’s (Burnet 2020) mission: To achieve better health for vulnerable communities in Australia and internationally by accelerating the translation of research, discovery and evidence into sustainable health solutions, is dependent on the performance, commitment, innovation and diversity of our workforce. We recognise that change is needed to achieve gender equity at Burnet and are focused on achieving this. As part of a new ‘One Burnet’ integrated organisation, highlighted in our Burnet 2020 Strategy, gender equity initiatives will be embedded in our strategic objectives. Burnet is currently involved in a range of gender equity activities, including participating in the Science in Australia Gender Equity (SAGE) Pilot of Athena SWAN and through our Gender Equity Committee. Burnet Institute is taking part in the Science in Australia Gender Equity (SAGE) Pilot of Athena SWAN in Australia. Athena SWAN is a highly regarded program that originated in the United Kingdom to provide an evaluation and accreditation framework for gender equity issues in the STEMM sector – science, technology, engineering, maths and medicine. The program rates the gender equity policies and practices of participating organisations and helps them to develop ways to promote and retain women and gender minorities in their organisations. Chair of Burnet’s Gender Equity Committee, Associate Professor Heidi Drummer said the Institute welcomed the opportunity to be part of the SAGE Pilot of Athena Swan in Australia. “Senior positions in science are overwhelmingly occupied by men, despite the fact that women comprise more than half of science PhD graduates and early career researchers,“ she said. “Not only is this inequitable and unfair, it’s a waste of expertise, talent and investment, and this impacts Australia’s scientific performance and productivity. “Gender equity is one of the pillars of Burnet’s wider mission, so it’s right and fair to advocate for equal opportunity for our own benefit and to support the sector to address a longstanding problem. “I’m confident the SAGE program will help us to achieve this." 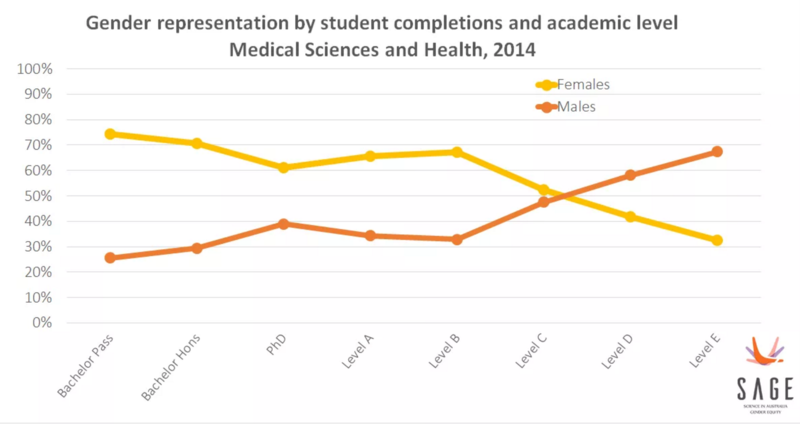 Diagram: Gender distribution of student completions and academic staff in Medical Sciences and Health. Source: Higher Education Research Data, 2014. The Athena SWAN charter began a decade ago with only 10 universities involved, but it is now embraced by nearly every STEMM education and research institution in the UK. In Australia the SAGE Pilot launched in September 2015 with 32 Australian Charter members, including 25 universities, five medical research institutes and two government science organisations, now has 40 institutions involved. Each participant organisation must apply for an Athena SWAN Bronze Institutional Award, demonstrating a solid foundation for eliminating gender bias and developing an inclusive culture that values all staff. Burnet Institute is part of Cohort 2 along with Federation University Australia, James Cook University, Defence Science and Technology Organisation, Bond University, Macquarie University, University of the Sunshine Coast, and the Australian Astronomical Observatory. Forty institutions around Australia are taking part in the SAGE pilot, whereby they must apply for an Athena SWAN Bronze Institutional Award, demonstrating a solid foundation for eliminating gender bias and developing an inclusive culture that values all staff. Chaired by Associate Professor Heidi Drummer, the Committee comprises a broad range of representatives from across the Institute, including our Director and CEO, Professor Brendan Crabb AC. The Committee is developing a number of gender equity-related objectives and initiatives that will assist the Institute in achieving its Burnet 2020 strategic goals.